Mary Ann and a friend saw a need and started their own nonprofit to help organizations like Angel’s Wish. It is called 2 Crazy Cat Ladies. 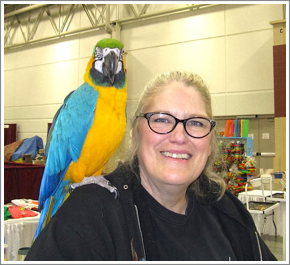 “Cathy and I, both cat lovers, met when we were both volunteering at a local shelter. It seemed that dogs always had more available to them: beds, treats, etc. and we wanted to change that. I started sewing beds and blankets, Cathy made toys, and we both started raising funds for the cats at the shelter. Soon, we wanted to do more for more and we started 2 Crazy Cat Ladies. My husband helped us with the incorporation papers (2013), non-profit status (2013), and was our accountant until he passed May 2015. We’re still looking for someone to help us take care of all that stuff! As more and more county humane societies lost funding to support stray cats, we saw a real need to assist those small groups that weren’t going to turn their backs on stray and feral cats. This was a real opportunity for us to live our motto: “Working to make EVERY cat, a WANTED cat”. Since we started in 2011, we have donated almost $13,000 to groups that are making a difference in the lives of Wisconsin cats. Groups like Dane County Friends of Ferals; Farm Feral and Stray in north west Wisconsin; Shelter from the Storm (Madison); Community Cat (Whitewater); Feline/Canine Friends (Westfield), and Angel’s Wish. I’m also involved in a transport group, Badger Rescue Animal Transport Services (BRATS) that transports animals within Wisconsin. Angel’s Wish was willing to take some cats from Fond du Lac HS and Menominee, MI and I provided the transport. That’s how I got involved with AW. We so appreciate their willingness to help other shelters and in turn, will help them financially. What do I enjoy most: Meeting fellow cat lovers at events is very rewarding; the thank you notes we get from folks who receive a check are especially heartfelt; knowing we’re helping to make a difference in the lives of Wisconsin cats is the best! *Recently Cathy had to resign because her life got so busy she didn’t have the time anymore. Mary Ann is looking for volunteers to fill this position. Think of it as a Crazy Cat Lady in training.